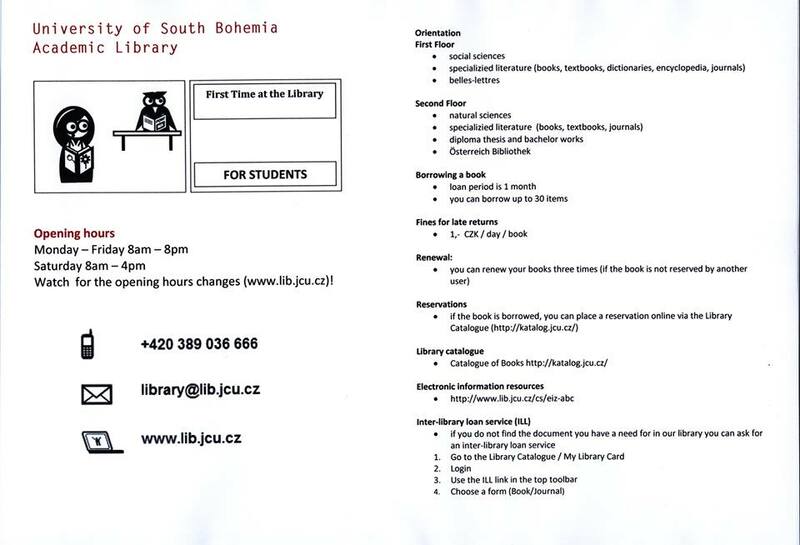 Welcome to the University of South Bohemia campus, here you can find campus map, services available in campus and information of what you can find in nearby surroundings. not marked buildings between Dormitories and Faculties of Science and Agriculture are Biology center of Czech Academy of Science and its research institutes. You can explore one big building next to dormitory K1 where is main Canteen called Menza. Menza has 2 floors. On the ground floor there is a dining hall, where you can get meals that have not been pre- ordered and it cost approximately 20 – 30 CZK. Next to it, there is a pizza restaurant where you can choose from various kind of pizza and one pizza costs about 50 CZK. The ground floor also offers small shop with books, paper goods, basic goods in drugstore, cigarettes and a snack bar. On the first floor there is a canteen for pre-ordered in the left side and non-pre- ordered meals in the right side. You can also order meals called “specialities” in the right side. There are other canteens at the Faculty of Health and Social Studies and Faculty of Theology and in the hospital. You can order your meals either via the internet or at the terminal on the ground floor of the main canteen. Groundfloor of Dormitory K4, selection of fine tea, snacks, board games. Actualities here on FB page. and there are also many other restaurants, bars and pubs within close proximity of campus and also in city center. Almost everywhere in campus you can encouter vending machines for drinks and snacks. Next to the bus stop Jihočeská univerzita there is also kiosk where you can buy drinks and snacks. You can find the main library on the university campus across from the rectorate and the Faculty of Philosophy. There is a small non-smoking snack bar and a textbook shop on the ground floor. You can return your books at the front desk of the library. The books can also be returned to the box next to the entrance from the car park. Entry to the main part of the library is allowed only with the ISIC/JU card. The library is a quiet place suitable for studying; you can find plenty of privacy there. There is wireless connection throughout the building. You can explore there also computer lab. There is an online catalogue and book reservations available. In the library you can also copy (payable) and scan your documents, you only need to have your ISIC/JU card charged for at least 50 CZK. Other buildings of the library are to be found at the Faculty of Theology and the Faculty of Fisheries and Protection of Waters in Vodňany. There are also study rooms at the Faculty of Health and Social Studies and Pedagogical Faculty on Dukelská Street. We would like to point out that library is there for studying and reading, so please BEHAVE QUIETLY, DO NOT EAT AND DRINK THERE AND CLEAN YOUR MESS! In case of repeatedly bad behaviour you can be banned from using the library! More information about library services ca be downloaded here. · “Bobík” – a low building across from the K4 student hall, entrance round the corner with ISIC/JU card. You can scan, print, copy and charge your ISIC/JU card for printing and copying here. Academic library – printing, copying, scanning on the 1st and 2nd floors. · You can also use the computer labs, libraries and study rooms at the faculties. You can copy and print in the menza in the small shop. But you can not use your ID university card. Open: daily – weekdays from 7.00 to 23.00 hours on Saturdays and Sundays from 8.00 to 24.00 pm. Closed: during national holidays, Christmas Eve and New Year’s Eve. For more details see rostering . All information regarding IT services can be found here. There are washing machines in dormitories K1-K4 and K5, you can use washing machine even if you are not living in dormitory. Come to the reception of dormitory and ask for renting washing machine. You will recieve a key to laundry room, the fee to use laundry room and washing machine is 25 CZK for up to 3 hours. They will also ask you probably for your student ID to leave at reception until you are finished (especially students living outside dormitory). After you wash your clothes you can also rent a rack for drying and drying room for free (fee is 5 CZK after using for more than 48 hours). And if you need iron and board for ironing, also not a problem: Iron is 10 CZK ( for use up to 5 hours) and board for ironing is for free (fee 5 CZK after 5 hours of use). Almost all necessary goods are available on and around the campus. Right on the Šumava Square there is a Billa supermarket open every day. Next to it there is also a DM drugstore and two cash machines. Across the square you will find another drugstore and a post office. 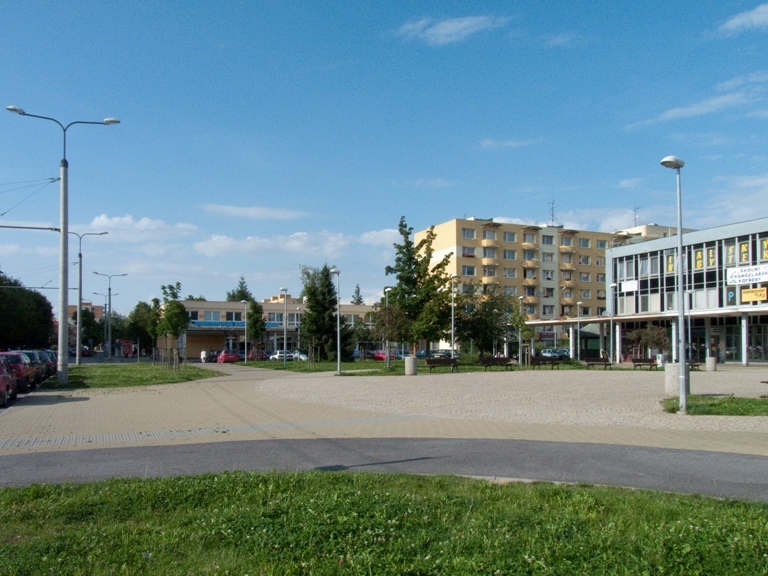 By following Větrná Street, you will come to the Čtyři Dvory shopping centre. There you will find a cinema, bookstore, petrol station and an Albert supermarket. The Kaufland Hypermarket is half way from the halls of residence to the city centre. Also nearby the campus there is also Tesco where you can buy everything what you need. Tesco is located next to the dormitory K5, you can go by bus number 41 from dormitory or university stop. Our University is trying to preserve our environment. So please during your stay at our University try to follow some basic rules. We are trying to Recycle as much as possible, so please separate your garbage and use specialy designed containers like paper, plastic, organic waste… Reuse materials, products (e.g. plastic bags, refill your bottles…) and try to Reduce the production of your waste. In campus and other university buildings you can find „Hliníkožrout“ – in english we can call it „Alluminium eater“. But sometimes the sign could be missing. So recognition tips: Alluminium is grey non magnetic metal, when you fold it, it will hold the shape and it is easy to tear appart. You can help not only by collecting the alluminium from different products but also you can help with sorting out of alluminium. This event is done after big amount of alluminium is collected. People gather together and sort alluminium and non alluminium stuff, it is usually great fun and you will do something really good. We will inform you of upcoming events. Please give your old bateries to these boxes instead to bins. Batteries are full of dangerous materials like mercury (Hg), lead (Pb) and cadmium. Therefore they belong to speciall place after you use them. Boxes are at Faculty of Science, Biology centre and Academic library. Is possible to give your biological material to the compost and also is possible to use it for your purposes. From time to time is needed to resort the compost – come and manually mix the layers of the compost etc. You can again help in this activity.